BMW e30 m3, new build, sport car for sale. Body was in brilliant condition. 111000km on dash. Totally cleaned from all dust, rust, and coatings. Interior, engine bay, trunk and under was extra rust threated and painted with matt gray polyurethane paint + black gloss poly. paint on roll bar. Safety homologated roll bar and other sport reinforcements was done. S54b32 engine, 6 speed manual gear box with short shift, 3.68 limited slip differential with big drive axels from BMW motorsport was mounted on polyurethane bushings. All oils and lubricants was changed. Full stainless steel exhaust with miltek resonator installed. Catalytic converter is on the car. 325mm front, 328mm rear, fully ventilated brakes, with hyd. handbrake, new lines, hoses, dot 5.1 is on the car. KW shock absorbers with lowering springs, all poly. Bushings, aluminum front arms, adjustable rear suspension is on. Sparco REV seat with rrs seatbelts, rrs steering wheel with fast connection is on. Passenger place is totally prepared to install seat and seat belts. All wiring was built individually for this car. ECU was reprogramed with safe upgrade. Electronic windows, heating and ventilation, single wiper, all lights are working. All these and a lot of other modification were done on this car by our company. All performance components are easy available on market, that’s why to race or use this car in much cheaper than original. 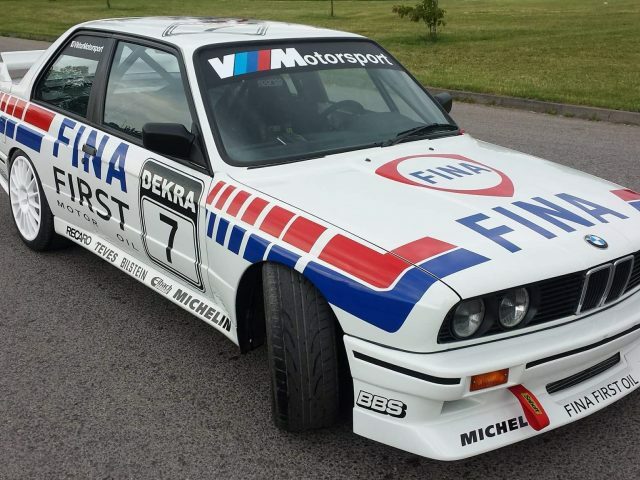 If you are interested in other old school BMW with performance set, price for this car or some components or color is not satisfying you, or you want to get any more details, feel free to contact us by email, by facebook ViktorMotorsport or by phone. Vendo Porsche gt3 Rsr anno 2002. Nel 2003 l auto ha partecipato a gare endurance (6 ore nurburgring), giro di Italia ed é stata impegnata nelle stagioni 2014 e 2015 nel campionato italiano velocita montagna (CIVM). Vettura ufficiale Porsche.